VG10 - What makes VG10 so good? Damascus - Many of the VG10 knives I stock are wrapped in Damascus. Also known as 'pattern welded steel' softer alloys are repeatedly heated and forged, layered and folded to create a beautiful aesthetic. Damascus has a complex creation process and requires lots of time and concentration from a very skilled craftsmen. ​White Carbon Steel - White steel is as near pure carbon as you can get. This makes for a knife that can take a great edge and keep it. It sharpens easily too even when heat treated to a high level of hardness. For the novice it's worth bearing in mind all carbon knives do require extra maintenance. They will discolor or develop a patina on the surface - They should always be wiped between uses and always dried after being washed. Over time if some surface rust does appear it needs to be removed with warm water, a drop of lemon juice and a plastic scourer. Aogami Super Blue Steel - This is considered to be just about the best mix found for a high carbon steel for knife making. 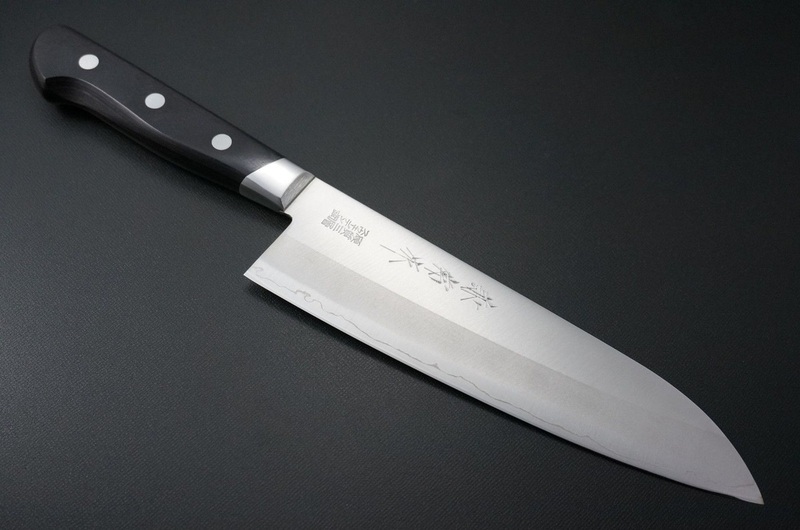 Carbon steels can deliver amazing levels of sharpness and Super Blue is considered to be about as good as it can get. Easy to sharpen and giving a silky smooth cut. As with the White Carbon and any other carbon combination extra care is needed when storing and maintaining. Tang - ​The term full tang means that the knife/sword is one solid piece and the 2 handle pieces are pinned on to the blade, one on each side. This is the strongest of the tang types. Half tang knives go the length of the knife handle, but only half the width of it.